I get excited as November unfolds. The feeling originates from a number of sources, one of them being Thanksgiving episodes on television. Friends particularly mastered the art of the Thanksgiving stories, in that it understood the core of what brings us joy – relationships. One feels compelled to spend Christmas with family, whether or not that is an enjoyable time. Yet, Thanksgiving is about being with the people we love the most, legal ties or not. As vital as the building of a friendship is to the meaning of our lives, it is also one of the most elusive aspects of our lives. Any number of us can name acquaintances, but a true friend – that’s something different. I remember a sociology class from college that espoused most friendships are based on proximity. I wanted to argue with the research. (And I think I did, actually.) Yet, the fact remains that it’s easier to be friends with someone we see on a regular basis than someone who lives far away. And if we are closely connected to someone at a great distance, there have to be some very strong ties that keep us bound together. Social media and technology can only do so much in maintaining a true friendship and not just a mere acquaintance. My friends are important to me. I try to invest time, provide support, graciously receive help, and find times for just having fun. We all know that many friendships will fade over the years, and others will end more dramatically and harmfully. That’s life. Yet, in spite of the impact life will have on our relationships, I do believe that we have true soul friends in this world. I am so grateful for my dear friends, especially the few I know to be soul friends. Even if not understanding my life’s journey, they still walked with me, and helped carry me when I stumbled. 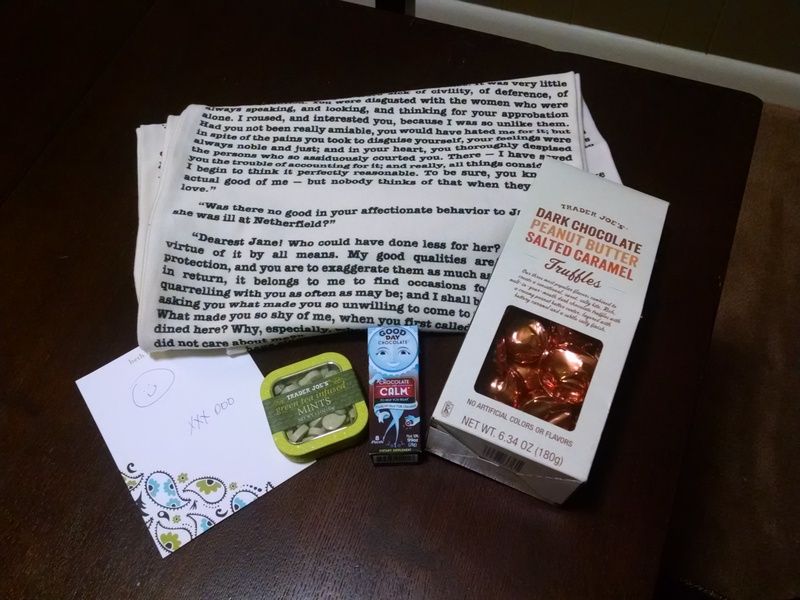 This past weekend was a bit of challenge for me emotionally, and in the midst of that challenge, my dear friend Beth unexpectedly sent me a care package (just like the ones I sent to my college kids earlier in the week). The picture above reveals the contents – some goodies from Trader Joe’s, and a beautiful infinity scarf with words from Pride and Prejudice, our favorite book. We live hours apart, and life is too full to talk or visit as much as we would like, but knowing that she is with me in spirit certainly lifts my soul. Here is to finding and developing your own soul friends!